Intel's aptly named Coffee Lake offers a frenetic amount of performance at prices unheard of from the chip giant. Intel’s 6-core 8th generation Core i7-8700K CPU is the reality check to high-performance, high-priced CPUs like the $2,000 Core i9 and $1,000 AMD Ryzen Threadripper. The real battle for the desktop and consumer’s wallets is with this amazingly affordable (for Intel anyway) $359 CPU, code-named Coffee Lake. 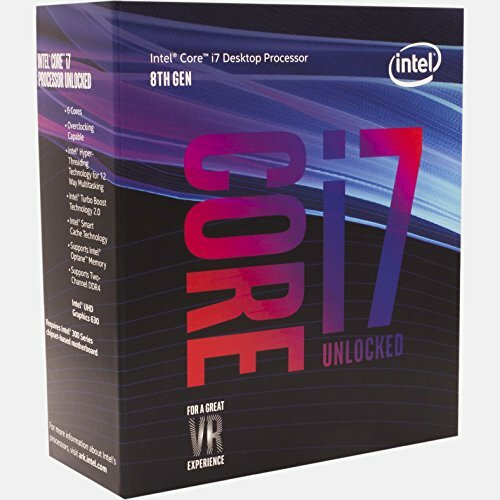 In fact, the Core i7-8700K is Intel’s first real response to AMD’s breakthrough series of Ryzen 5 and Ryzen 7 CPUs, and a viable alternative to the Zen-based CPUs. But just how fast is it, and which CPU should you buy? Read on to find out. 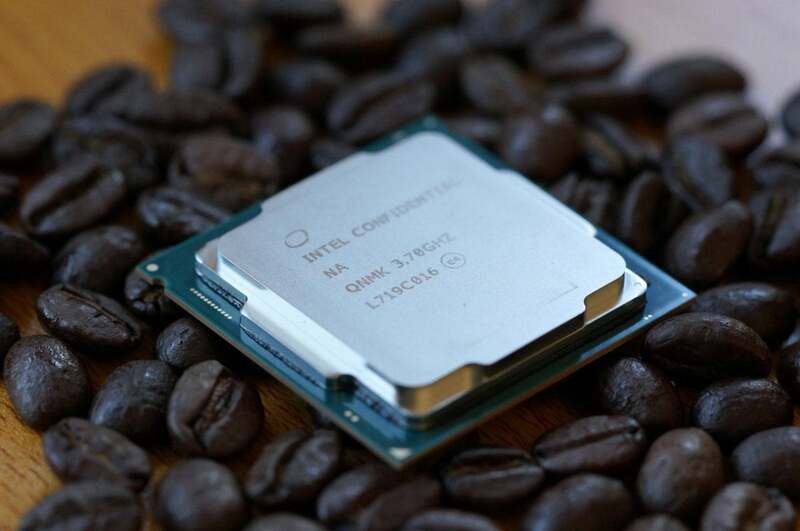 Intel’s new Coffee Lake Core i7-8700K is a serious cup of joe for those into performance. Moore’s Law isn’t dead, but the ability to shrink CPU circuits and increase density has drastically slowed down. 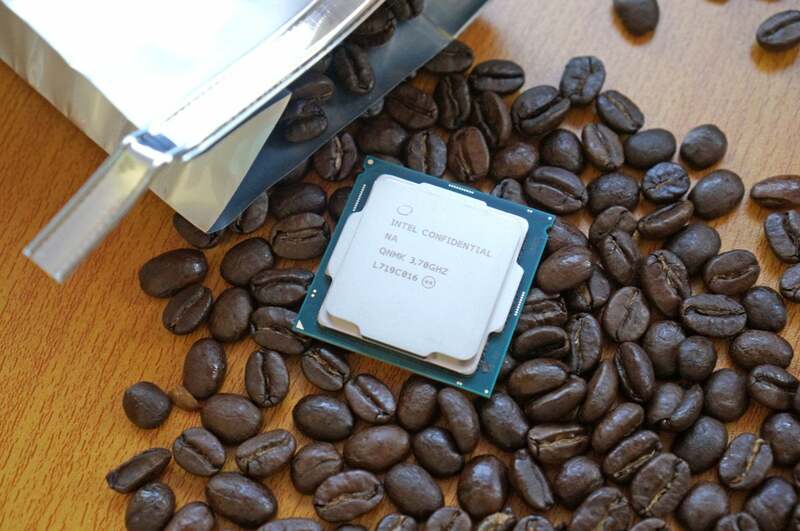 Coffee Lake, for example, is based on the same 14nm process the company introduced with its Broadwell line of laptops CPUs in 2014. Since then, Intel has used the 14nm process on Skylake, Kaby Lake, and now Coffee Lake. Despite the similar process, however, Intel says it’s made enough improvements along the way to call Coffee Lake a “14nm plus plus” chip. A simpler way is to think of Coffee Lake as an improved 7th-generation Kaby Lake chip with two more cores, though there are some subtler changes. Intel’s top mainstream CPUs alongside AMD’s fastest Ryzen 7 CPU. So yes, cynics, the only true “8th-generational” part may be the name itself. Folks of a more forgiving mindset will see 8th-gen chips as a big breakthrough for Intel, which has offered quad-core CPUs as luxury models exclusively for the last ten years. Consider that Intel once charged $1,000 for 6-core CPUs. With Coffee Lake, you’re getting two more cores for the nearly the same price as Kaby Lake and Skylake. 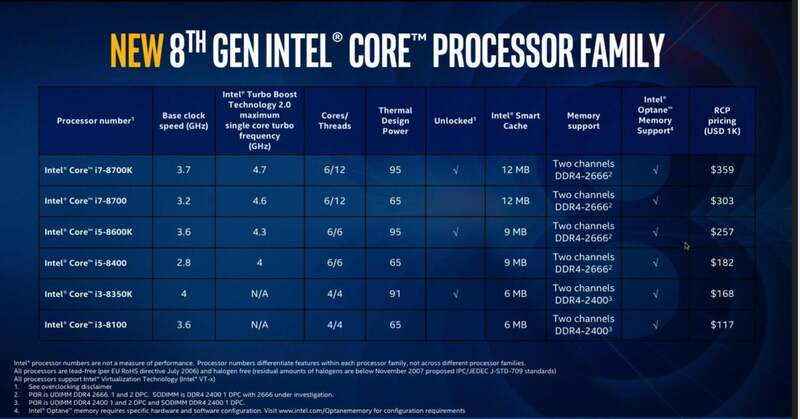 Here’s the full line up of “8th generation” CPUs from Intel. Although Coffee Lake is essentially an improved Kaby Lake CPU, some key changes will drive Intel fans simply batty. The main one is its incompatibility with older motherboards, despite using the exact same physical LGA1151 socket. Why, Intel, why? The company cites several changes. The first is official support for DDR4/2666 instead of of DDR4/2400. The higher-clocked RAM required more tightly controlled layout of the wires or “traces” on the motherboard, which mandated new designs. Coffee Lake also adopts the nifty “per core” overclocking first introduced with the Core i7-6950X Broadwell-E. This allows a user to overclock just individual cores based on the workload. All this added up to the Z370 chipset you’ll find on new motherboards, the company said. One thing that isn’t clear, however, is why Z370 won’t work with older CPUs. Because both the Z270 and Z370 use the same socket and pretty much the same chipset pinout, why can’t you put your older 7th-gen Kaby Lake into a newer Coffee Lake Z370 mobo? All Intel would say is its board partners actually requested a clean break from the past with the new chipset. 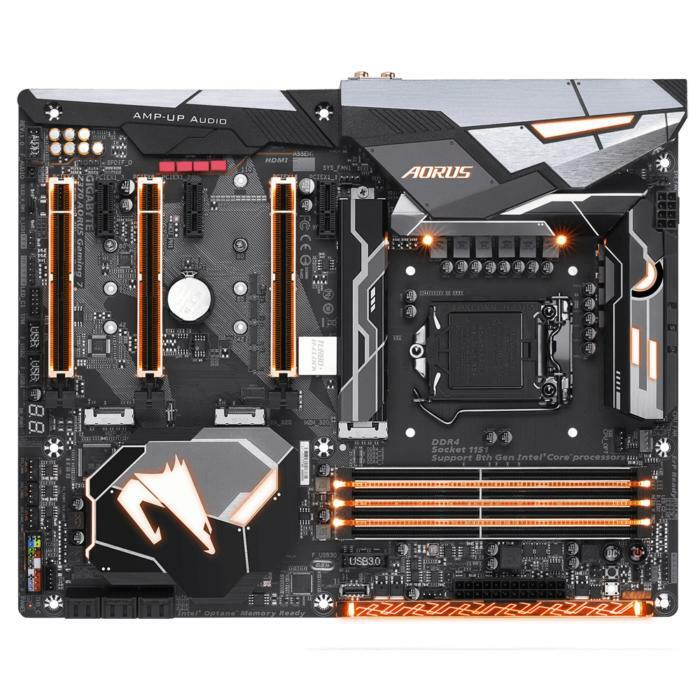 The Gigabyte Aorus Gaming 7 used for our tests features the exact same socket that previous-generation Intel chips used but will work only with 8th-generation chips. For this review, we looked at the top chip of the lineup: the Core i7-8700K. We compared it primarily to its nemesis: AMD’s Ryzen 7 1700X. Although technically priced at $399, we easily found the chip for $359 at Amazon.com or even cheaper when on sale. Our original review of the Ryzen 7 was focused on the top CPU, the Ryzen 7 1800X, but a lot has changed since March. So we took our original Asus Crosshair VI Hero build, updated to the latest available BIOS, installed a fresh copy of Windows 10, and the latest AMD drivers and Ryzen power plan. We also changed out the RAM. Our original Ryzen test filled all slots with DDR4 RAM, which limited the memory speed to JEDEC standard DDR4/2133 (a limitation of Ryzen at the time). For the Coffee Lake showdown, we dropped in 16GB of DDR4/3200 instead, to give the Ryzen 7 chip every opportunity to shine. If you don’t follow current events, you should know Ryzen’s memory controller and Infinity Fabric have a very close relationship, and the higher-clocked the memory you use, the higher the performance potential. For GPU we again used a Founders Edition GeForce GTX 1080 card, updated with the latest Nvidia drivers. On the Intel side, we used a Gigabyte Aorus Gaming 7 board with a matching Founders Edition GeForce GTX 1080 card, a clean install of Windows 10, and the same model of Kingston SATA SSD for the primary boot drive. For RAM, we initially used a matching set of 16GB DDR4/3200 from our Ryzen build. When calibrating our system against numbers provided by Intel, we found the system actually performed slower when selecting the XMP profile for 3,200MHz. In the end, we swapped in another pair of modules rated at 2,400MHz and got closer to the numbers Intel said we should expect. Intel’s new 8th-gen Core i5-8600K (lower left) next to the 8th-gen Core i7-8700K (lower right.) On the top left is a Core i3-7350K Kaby Lake. In the top middle is a Core i7-7700K Kaby Lake. The last, larger chip is a Kaby Lake X Core i7-7820X, which fits in the same socket as Skylake X. To dig into the performance characteristics of Core i7-8700K, we ran the CPU through a gauntlet of rendering, encoding, and other productivity tests. If you use mostly Office applications, a browser and gaming, our single-threaded performance results matter more. If you edit video or perform other CPU-intensive tasks on your PC, pay closer attention to the multi-threaded performance. Our first test is Maxon’s Cinebench R15. It’s a popular, free benchmark based on the same engine used in the company’s professional Cinema 4D program. Professional 3D rendering tends to like CPU cores and threads, and the default setting for Cinebench exploits all available cores. The multithreaded results bear this out, as the CPUs we’ve tested sort out based on the thread count. In the crazy range, we have Intel’s Core i9 chips and AMD’s Threadripper. From there the list sorts out nicely based on the number of cores and whether the CPUs have Symmetric Multithreading (SMT), or what Intel calls Hyper-Threading. The Cinebench R15 puts the 6-core Core i7-8700K between the 8-core and 6-core. In multi-threaded tests, the new Core i7-8700K (the second orange bar in the chart above) straddles the line between the performance of a 6-core CPU and an 8-core CPU. In Cinebench, which scales very well with the number of cores, it comes very close to the performance of an 8-core. The Ryzen 7 1700X easily walks away from the Core i7-8700K, but if you have any doubts as to whether Core i7-8700K is better left to compete with AMD’s 6-core Ryzen 5 chips, the result above should answer that. 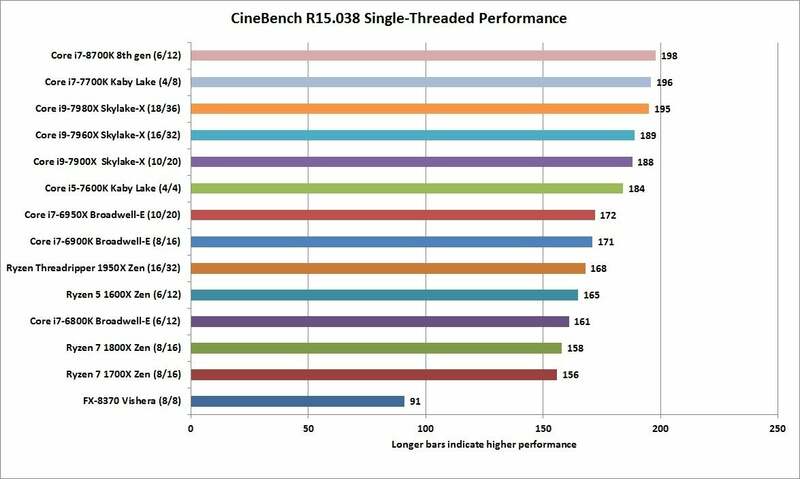 We also run Cinebench in single-threaded mode to measure the performance of a CPU when an app or game only uses one core. For the most part, such a test favors CPUs with higher clock speeds and greater efficiency. With Core i7-8700K (see the pink bar below), you get that in spades, hearts, clubs, and diamonds. For single-threaded tasks, the Core i7-8700K squeaks by the Core i7-7700K CPU to win the day. With a boost clock of 4.7GHz, the Core i7-8700K slides past the previous top dog, the Core i7-7700K which has a top boost clock of 4.5GHz. 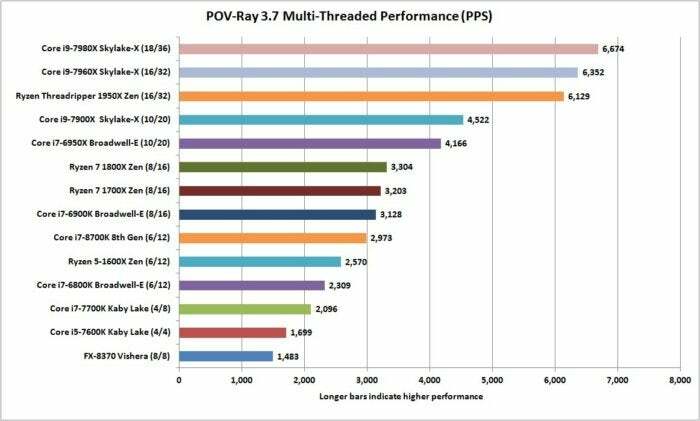 Intel actually dominates the single-threaded performance with 8th-gen, Kaby Lake and Skylake-X lining up in an orderly fashion ahead of the pack of older Intel CPUs and AMD’s chips. AMD fans will protest that single-threaded performance doesn’t matter in a multi-threaded world, but the harsh truth is a huge swath of applications and games don’t exploit more than one CPU core at a time. Despite taking a backseat to Ryzen 7 1700X in the multi-threading test, Core i7-8700K wins this one in a big, big way. Our second test is another 3D render app called Blender. It’s an open-source, free application that sees heavy use in many independent movies. Like Cinebench, it favors more cores and more threads, but we’ve found that it doesn’t always scale that well with core count. Blender’s performance can vary greatly with the workload thrown at it. For our test, we use the free BMW CPU test. The result (see the navy-blue bar in the middle of the chart, below) shows the sheer strength of this spunky little 6-core Coffee Lake chip, which isn’t content to slum it with the 6-core Ryzen 5 and Core i7 Broadwell-E chip. Its score, in fact, is dead even with the 8-core Ryzen 7 1700X. A 6-core chip that can hang with the 8-core chips is something to be respected. The Coffee Lake CPU actually ties with the Ryzen 7 1700X in this multi-threaded Blender test, despite having four fewer threads than the AMD CPU. The Persistence of Vision Raytracer (POV-Ray) is a ray tracer that dates back to the days of the Commodore Amiga. 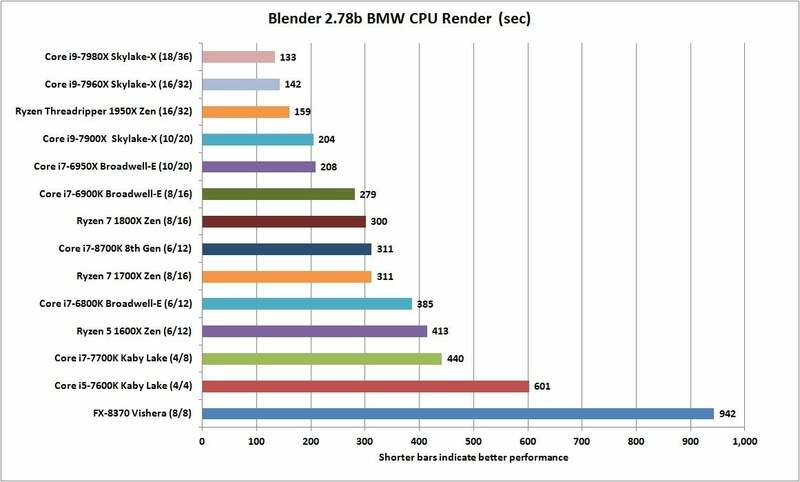 Like Blender and Cinebench, it generally favors efficient CPU cores. Once again we see the 6-core Core i7-8700K (the second orange bar, below) hanging closer to the 8-core CPUs than the 6-core chips using the internal benchmark. Again, the 6-core Core i7-8700K really punches above its class. We also run POV-Ray’s internal single-threaded test. No surprise, the high-clocked Core i7-8700K (light blue, below) and Core i7-7700K (light pink, below) are in a dead heat. The lineup reinforces Intel’s lead in single-threaded apps, just as we saw in Cinebench. The first AMD CPU straggles in at 9th place. If you’re wondering why the Ryzen 7 1700X actually loses to the cheaper 6-core Ryzen 5 1600X, it’s likely due to the slightly higher clock speeds of the budget 6-core chip. 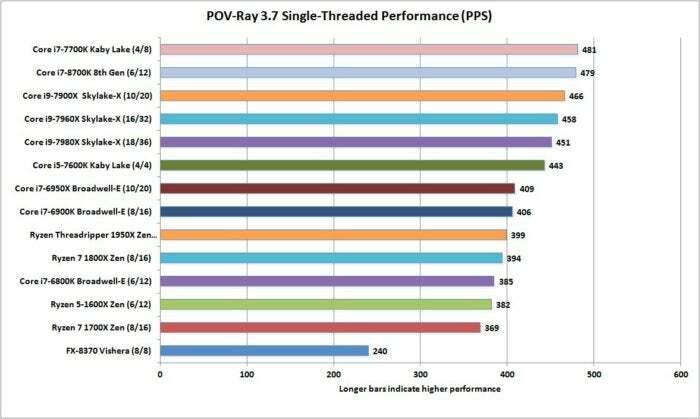 Wow: POV Ray’s single-threaded rendering benchmark puts the 6-core CPU right alongside the quad-core Core i7-7700K. Our final 3D rendering test is fairly new to us and actually came to our attention through AMD. Our sample set is smaller, but it again shows the Ryzen 7 1700X just can’t shake the Core i7-8700K (the blue bar at the bottom). The Ryzen 7 wins—but by an uncomfortably slim margin considering it packs four more threads than the Core i7-8700K. 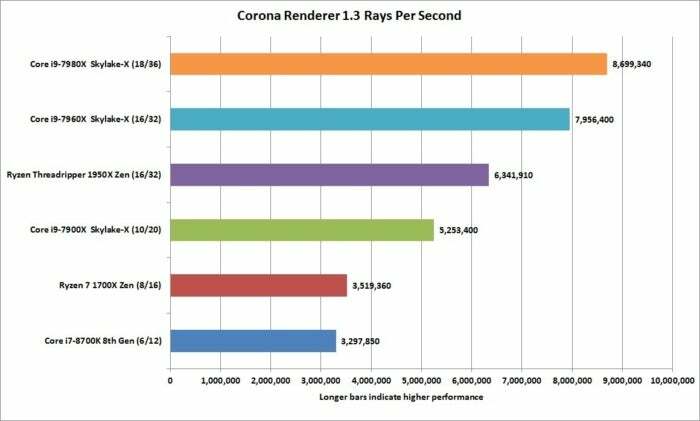 The Corona Renderer benchmark again shows how the 6-core Core i7-8700K outdoes itself with performance just shy of the 8-core Ryzen 7 1700X. The world isn’t all about rendering 3D models, of course. More people are likely to be encoding video instead, which is where the free and popular Handbrake encoder comes in. For this test, we use an older version and convert a 30GB, 1080p MKV file using the Android Tablet preset. 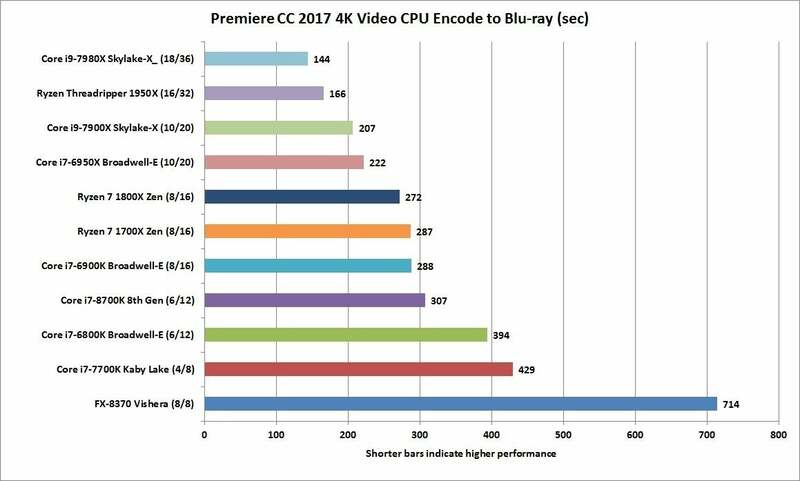 Handbrake tends to favor CPUs with more cores and threads, and we see that familiar pattern: Core i7-8700K (the second orange bar, below) hanging right there with the 8-core CPUs, rather than with the 6-core chips. It's not enough to outpace the 8-core Ryzen chips or the the 8-core Broadwell-E, but it's closer than you’d expect. 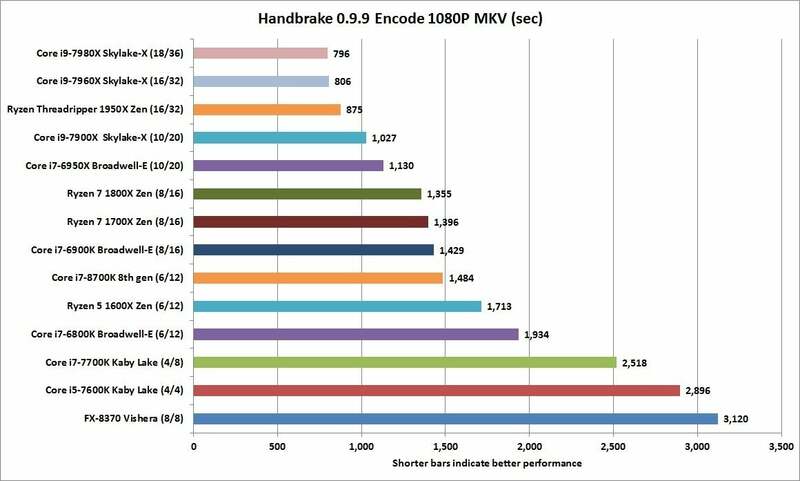 Our Handbrake Encode shows the Core i7-8700K keeping pace with the 8-core CPUs rather than with the 6-core chips. Our next video test uses Adobe’s professional Premiere Creative Cloud 2017 to encode an actual video project shot by our video crew in 4K on a Sony Alpha camera. For this test, we keep the video project on a Plextor PCIe SSD and write the project to the same device, in order to remove storage variability from the test. We use Premiere to encode it using the Blu-ray preset and select the Maximum Render quality option, which ups the image quality when changing resolution (which we also do.) We specify that Premiere use the CPU for encoding rather than the GPU. Some video professionals will scoff at using much slower CPUs for a video job, but image-quality snobs will argue that the best result is achieved using the CPU. The 6-core Coffee Lake chip hangs with the 8-core chips in our CPU-centric video encoding test. 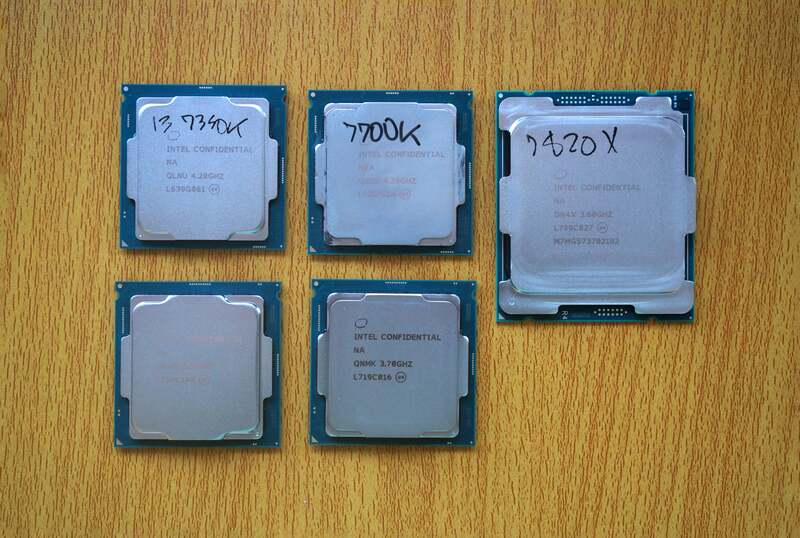 The results again put the 6-core Core i7-8700K in the running with the 8-core chips. 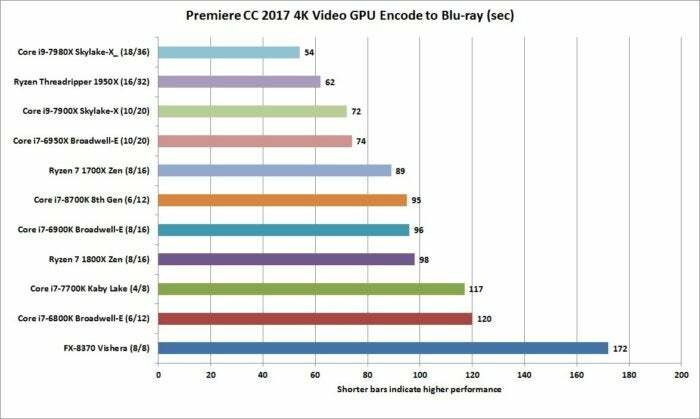 But we still hear those video pros tsk-tsking our choice of CPU encoding, so we also ran our test using the GeForce GTX 1080 for CUDA-based encoding. Though some believe the CPU makes no difference, it’s clear that core count still matters even on a GPU encode. It’s also clear the Core i7-8700K can hang with those 8-core CPUs. Despite being just a 6-core CPU, the Core i7-8700K hangs out with the 8-core CPUs for GPU-based encoding. For our Threadripper and Core i9 tests, we didn’t dwell on gaming performance. Although important, those who buy $1,000 and $2,000 CPUs need them for rendering and encoding, not gaming. When you’re talking about $360 mainstream chips (albeit higher-end mainstream chips), gaming matters a whole lot more. Because we wanted to use the very latest GeForce drivers on our tests, we also restricted our results to the Ryzen 7 1700X and Core i7-8700K, as we don’t have every single CPU on record using the newest GPU drivers.